You know that kind of people who are just a little too confident for their own good? Yeah. Oh! I didn’t confirm this before, but Bookwyrms will keep updating throughout the holidays! After hearing readers’ thoughts on this, I am going to do my best to print the thick volume I had in mind in the beginning (instead of shorter issues). It makes more sense in many ways: The content is already published, so printing shorter issues would mean the reader has to make several purchases to get to where the comic is at right now. In the long run, it would be more expensive to print (and to buy) several short issues than a large volume. There’s one important drawback in doing volumes, though. A volume is more expensive per se than an issue. This means that I will need to reach a higher goal during the funding campaign in order to make it happen at all, with slightly higher priced rewards than if I published a short issue. 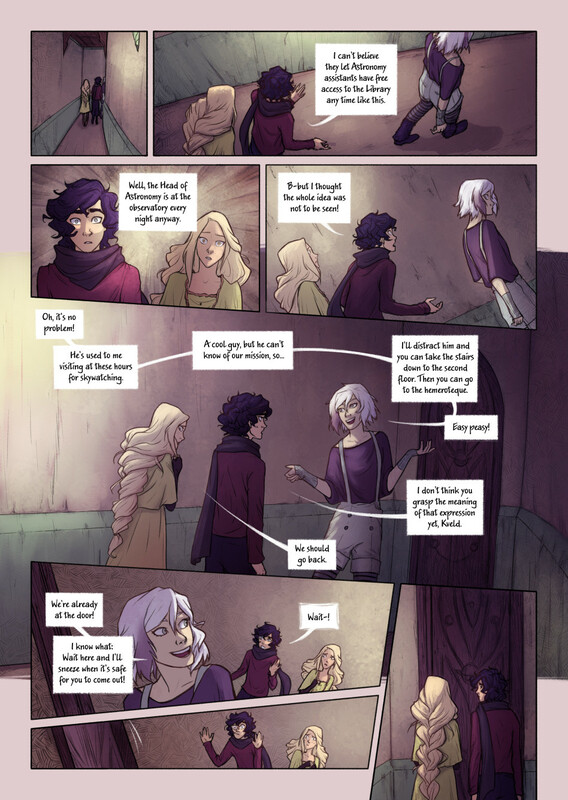 It’s going to be a challenge, and one that I don’t think I can reach with Bookwyrms’ current readership just yet. BUT I just finished calculations on the exact amount of pages left to do for volume 1, and these are 26. This will give me a few months to hopefully find more readers and be in a position where I have real chances to reach the goal. This is where subscribing to the newsletter helps: It gives me an idea of how many readers are really interested in buying the volume. So if you haven’t yet, and you are interested, go ahead and subscribe! Thank you everyone! ♥ Have a lovely rest of the week! Definitely agree with the thicker volume for you. :3 After giving the smaller issues a spin and coming to the conclusions that they’re mighty cute and you can make them real artsy, the inconveniences are inevitable not to mention the expense, so even I left that idea as the testrun it was and move on to the same method: Bigger stuff. It’s been a difficult choice! I, too, think short issues are nice, but for stories that have been running as long as ours, I guess volumes make more sense. Can’t wait to see yours! I hope you’ll be able to achieve your readership goal 🙂 If there’s any way we could help Bookwyrms get some more exposure, let us know! Lol, there is no stopping her nowww!!! Obvious sneezing is going to be so obvious! Ah, I wish I knew the key to growing readership but I am still figuring that out myself. ^_^; But I agree with Laura, let us know of any ways we can help you. Best f luck with the funding! Making a bigger volume makes sense.